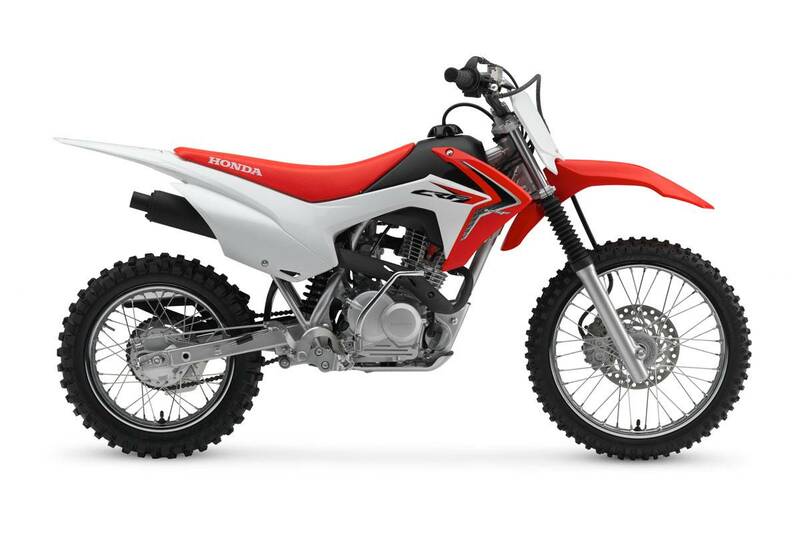 The CRF125F features an air-cooled, four-speed engine with electric start, a durable frame and quality Honda performance. The CRF125F will be everything a young entry-level rider could possibly hope for. The robust and low maintenance 124cc, air-cooled, SOHC engine delivers strong and linear bottom-end torque which is ideal for the younger rider. Fed by a carburetor, the airbox design which is located lengthwise, saves weight, increases airflow and also locates the compact battery needed for the electric starter. Powerful, zero-fuss CDI ignition boosts performance, as does the exhaust while the four-speed manual gearbox and clutch are smooth changing and easy to use. The drive sprocket cover is no longer integrated with the ACG cover allowing for improved accessibility. To ensure a stable and engaging ride, a brand new steel diamond backbone frame gives the CRF125F's chassis the perfect balance of rigidity and strength. With the aim of being manageable for most youngsters aged 10 and above, the new CRF125F has a slim frame and low seat height. Control is further guaranteed thanks to the wide-set footpegs and brake pedal which match narrower handlebars. Half-waffle rubber grips on the handlebars are the same used on the CRF450R. Beefed-up 31mm telescopic forks feature heavier weight springs while the new rear shock uses a 32mm diameter piston damper and separate air/oil/gas pressurization chambers to reduce emulsification. The high suspension quality means bump absorption, ride quality and tracking are much improved. A steel swingarm works through Hondaâ€™s Pro-Link system, and needle bearings have been used throughout to reduce friction. For stability and traction, the front wheel size is 17-inch, matched by a 14-inch rear. A 220mm front hydraulic disc brake - with adjustable span lever - deals out consistent and easy to modulate stopping power. It's complemented by the 95mm drum rear. With styling cues taken from the cutting edge design of Honda's CRF450R and CRF250R, the CRF125F is sure to be an instant hit with aspiring champions. Please note; all specifications are provisional and subject to change without notice. Images show overseas models. *All prices specified on this site are in Australian dollars and the products described and the offers made on this website are only available to residents of Australia. For the road registerable motorcycles where "Ride Away" pricing is stated please note the following: This price is comprised of the Manufacturer's Recommended List Price for a private buyer residing in the capital city of your State, 12 months registration, 12 months compulsory third party insurance, stamp duty, administration charges, and a recommended dealer delivery fee. Please confirm pricing with your preferred Honda Dealer as final on-road costs may vary according to your individual circumstances. For the off road motorcycles, farm two wheel motorcycles, and ATVs (non road registerable) where "Ready To Ride" pricing is stated please note the following: This is comprised of the Manufacturer's Recommended List Price and recommended dealer delivery fee. Manufacturers Recommended List Price, "Ready To Ride" and "Ride Away" pricing is subject to change without notice.